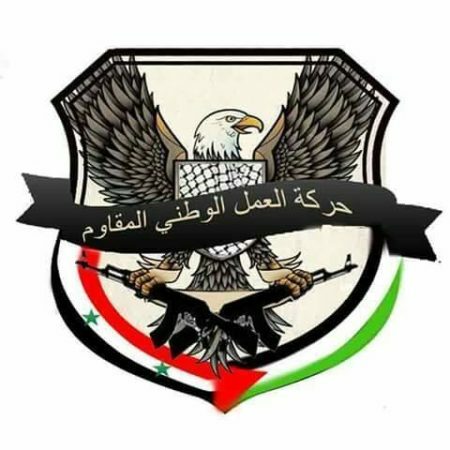 Emblem of Liwa al-Jalil, which features in the centre the name of the militia's political wing: "National Resistance Action Movement." In the branding of pro-Assad Palestinian militias, it is hardly surprising that there should be references to locations within the land of Palestine. 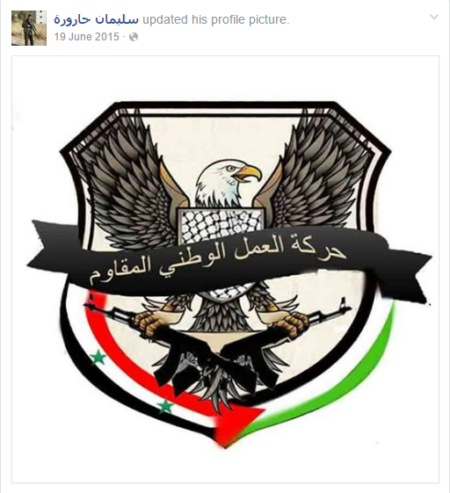 Liwa al-Quds (The Jerusalem Brigade), a Palestinian militia operating in Aleppo, is one example of this phenomenon. Another example is the Quwat al-Jalil (The Galilee Forces), previously profiled at this site. The Galilee reference is of particular importance on account of its proximity to Syria and border with the Israeli-occupied Golan Heights. The more recent emergence of Liwa al-Jalil (The Galilee Brigade), which claims to be distinct from Quwat al-Jalil and traces its founding to 29 May 2015, fits into this trend. "In view of the circumstances that our Arab Ummah in general and our Palestinian cause in particular are going through, and the danger that is threatening every country of resistance in this region, a fabric of our Palestinian and Syrian youth decided to form an entity of resistance that will be supporting those countries in the face of tyranny and hegemony that have not ceased since the occupation of Palestine until now. And the ideology of this entity depends on being the movement in the vanguard of the youth of resistance that wages war for the sake of liberation and independence whatever the circumstances and capabilities. And indeed our success in supporting this cause in Palestine or the countries of resistance that support Palestine is success in breaking the collar of servitude for every human being just as this fabric of the youth of resistance has strived and strives for. The movement arises on the basis of considering the Palestinian cause as the base cause since it is the first cause of humanity in its struggle with occupation and hegemony for the sake of liberation, therefore from a foundation of humanity and nationalism we take up our role in this conflict ideologically, politically and militarily to realize victory. The National Resistance Action Movement has been established in the midst of this ongoing conflict between the ideology of the resistance and the other side whose existence depends on waging war against this ideology. We will strive to rout and exterminate it under any cover because the liberation of peoples cannot come with the destruction of their lands and erasure of their identity of resistance. Therefore in our political plan we are intent on uniting ranks among all the Palestinian factions that support the ideology of resistance in word and deed, as well as preserving our Palestinian cause as the central cause, and that our sacrifices should be in the path of liberating the entirety of the Palestinian national soil through relying on the principle of resistance, not bartering with the enemy and its retinue. Our work on the land of the Syrian Arab Republic is to support the resistance axis and to keep safe at a distance the Palestinian camps that are present in the diaspora and are the most important components of the steadfastness of our Palestinian people and a focal point to support the victory of the cause: thus they should not be transformed and made a part of the internal conflicts for these lands to be rendered into an environment nursing ideas, deeds and plans against the countries that have supported and continue to support Palestine and the liberation of the Palestinian man. And they should not be transformed into a thorn in the side for these countries, for the deeds that are brought to bear on the name of the people of resistance not only aim to destroy the components of its steadfastness but also for deeds of greater ugliness and defaming this cause and the supporters of this cause, because the Zionist hands and their illegitimate entity are clear in these deeds, including the revival of the Antoine Lahad project in the southern region of the Syrian Arab Republic, whose plans and conspiracies we will undertake to thwart side by side with the Syrian Arab Army, and we will cut the hands of this entity from the source. Indeed our conflict is an existential conflict with Zionist thought, global hegemony and oppression of peoples." Note that the 'Antoine Lahad project' reference concerns the South Lebanon Army militia that worked with Israel during its occupation of parts of Lebanon. Liwa al-Jalil is thus portraying the rebel forces particularly in the south of Syria as allies and proxies of Israel. Similar sentiments to the aforementioned post are expressed in the charter issued by Liwa al-Jalil: e.g. article (1) affirms that "Palestine is a part of the Arab homeland and the Palestinian people is a part of the Arab Ummah. And its struggle is their struggle." In a similar vein, article (3): "Revolutionary resistance is the only means to liberate Palestine: all of Palestine." Likewise, article (9): "The liberation of Palestine is all of Palestine and destroying the Zionist entity in all its pillars." As far as organization structure goes, the charter claims a leadership structure operating on democratic principles: "Democracy is the means used to discuss and adopt decisions in the council of the secretariat of the movement." The overall leader of the group goes by the name of Abu Jihad, while the security official is one Ahmad al-Masri (seehere). On the military scale, the activities of Liwa al-Jalil appear to be very limited, and the group's openly advertised output is primarily related to the issuing of political statements and commemorations of various occasions. Examples of the latter type of activity include emphasizing the necessity of recapturing the Israeli-occupied Golan Heights as the path to liberating Palestine, congratulating the Syrian army and Assad on the recapture of Palmyra, commemorating Mother's Day, rejecting Gulf states'designation of Hezbollah as a terrorist organization (thus claiming attendance at a Palestinian festival on the peripheries of the Yarmouk refugee camp in solidarity with Hezbollah), and commemorating the anniversary of the Islamic Revolution in Iran. The group has most notably claimed military operations in defending the important al-Salam Highway, which connects Damascus and Quneitra, particularly focusing on the Khan al-Shih area in southern Damascus lying along this route (see map here for geographical orientation). In this context, it should be noted that Khan al-Shih is thesite of a Palestinian refugee camp. Within the Quneitra area, Liwa al-Jalil has also claimed operations in Kurum Jaba. 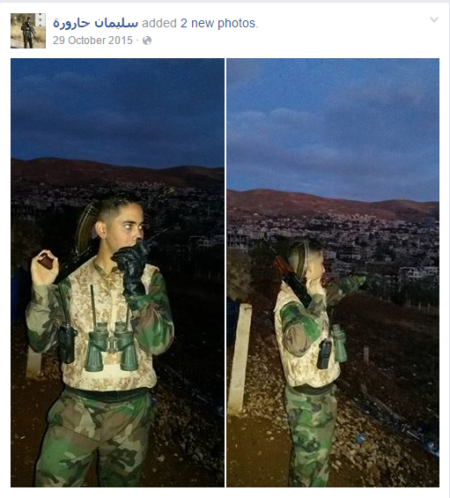 All of these reports are in keeping with the group's description of itself as operating in southern Syria. 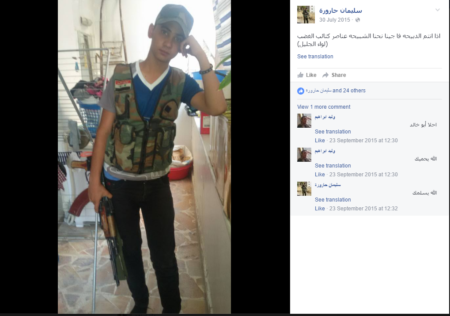 On 13 December 2015, Liwa al-Jalil declared a 'martyr' in one Muhammad Suleiman Harura, who was claimed to have been killed fighting in the Zabadani area. 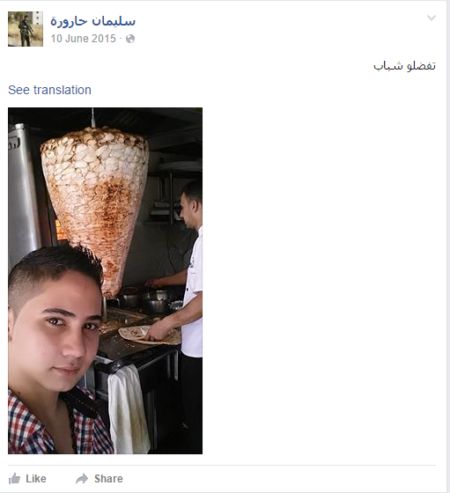 This 'martyr' is of particular interest as he had his own Facebook account, in which he had a number of public posts. 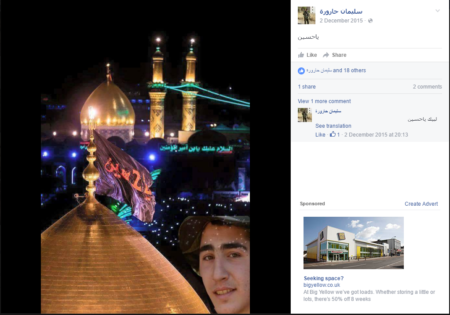 Some of the posts interestingly suggest an affinity with Shi'i Islam and Hezbollah. His posts also suggest he was particularly young, unlikely to have been much older than a teenager at the time of his death. 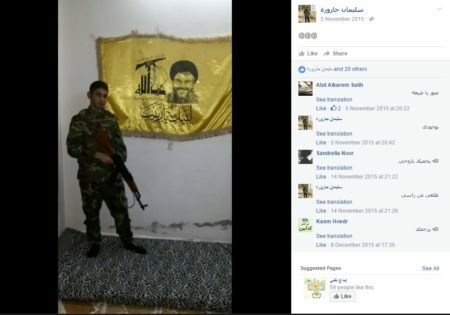 [Muhammad] Suleiman Harura posing with a Hezbollah flag including the slogan "Labbayk ya Zainab!" ("At your service, oh Zainab"), a common Shi'i jihadi slogan in reference to fighting in Syria. Notice the "Labbayk ya Zainab!" armpatch. His post reads: "God deliver Syria and the people of Syria, we offer our souls in sacrifice for Syria and the great people of Syria, and I swear by God Almighty that I will not abandon mother Syria: My regards to his excellency the President Bashar Hafez al-Assad." A post by Suleiman Harura featuring the Shi'i slogan "Ya Hussein!" "If you are the dhabiha, we have come as the shabiha, members of Kata'ib al-Ghadab (Liwa al-Jalil)." 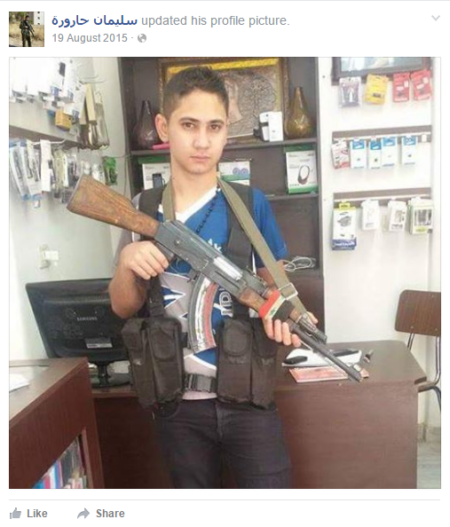 On the whole, Liwa al-Jalil is a very minor militia actor. Ideologically, the creation of multiple pro-Assad Palestinian militias, however insignificant they may be as military players, is useful for the regime narrative of being the upholder of the Palestinian cause and Arab nationalism (cf. 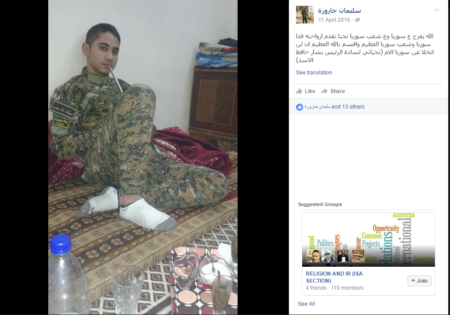 the Arab Nationalist Guard, another pro-Assad militia) and the wider 'resistance' bloc narrative of opposition to imperialism and colonialism. The existence of these groups may serve to give an inflated impression of Palestinian support within Syria for the regime.